Last night, I made a simple vegan butternut squash soup that was to die for! As it was stewing away on the stove, I looked at the small squash seeds and couldn't bear throwing them away. Instead, I wondered if roasting them would be a good idea. My experience roasting seeds has been limited to pumpkin seeds, but I figured butternut squash seeds wouldn't be too different. I washed and roasted them the same way I do pumpkin seeds, making sure to check them a little more often as the seeds are quite small. They turned out better than I could have imagined. So good! This recipe is super easy and only takes about 10-15 minutes. I had these babies washed, roasted, and served before the soup was even done stewing. 01. Preheat oven to 350 degrees Fahrenheit. Cut a butternut squash in half lengthwise and scoop out the insides. 02. While the oven is preheating, separate and wash the seeds. I usually separate the seeds over a colander so I don't lose any. Once you've separated the guts from the seeds, place them in a bowl of water and swish them around a bit. Let any debris settle on the bottom of the bowl and skim the seeds off the top. Gently pat them with a towel, but don't dry them completely. They'll be a little sticky, but that's good. We want to give our seasoning something to hold on to. 03. Place the seeds into a dry bowl or even a paper bag and add the seasonings. Give them a good shake to distribute all that yumminess. 04. Spread the seeds out in an even layer onto a foil or parchment lined baking sheet and place them in the oven. Roast for 5-10 minutes. I checked mine after five minutes and then again every two minutes. Take them out when they are looking nice and golden or when they start to pop and crack open. This recipe calls for the seeds from one squash, however one squash only yields about 1/3 cup of seeds. If you want to make this treat for more than one or two people, make a bigger batch with more squash. You can always freeze the extra squash or make soup (topped with the seeds, of course)! 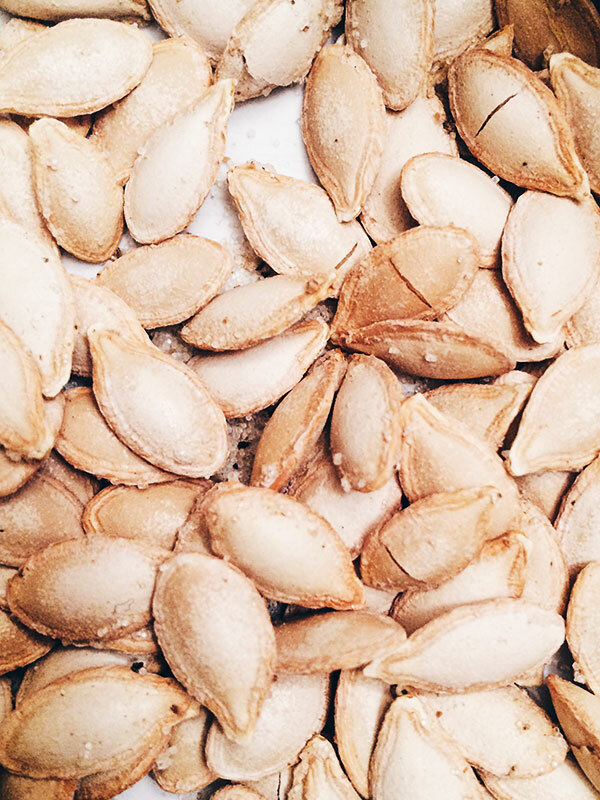 You can use this exact same method with pumpkin seeds, if you prefer. Since the seeds will be much larger, they may take a few extra minutes to brown. Add a little extra seasoning if your pumpkin provides more than about 1/3 cup of seeds. I honestly think the butternut squash seeds taste better, though!